While a phone call, email and social media can provide a cursory view of the personality and skills of a potential hire, most hiring managers wouldn’t consider extending a job offer for a significant position without an actual face-to-face meeting with the candidate. Why? Because non-verbal cues and cultural fit are too important to overlook. Technology has made the world a much smaller place in terms of our ability to instantly communicate with people electronically regardless of location, which is great. Until we can actually teleport, however, location does present some challenges for recruiters and hiring professionals in terms of the face-to-face aspect of interviewing. A good deal of time and money can wasted be when recruits, who end up not being a good fit, are flown in for in-person interviews at the company’s expense. And, if left to the applicant to handle travel expenses, some exceptional talent may choose to walk away rather than invest the time and money early in the interview process. And this is where video interviews come into play. 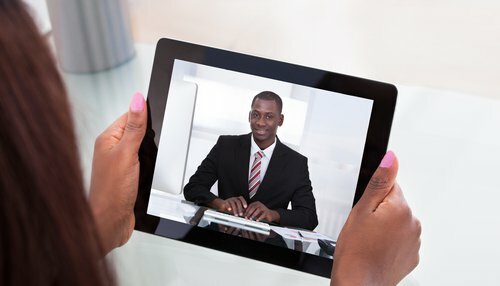 Video interviews offer the benefits of in-person interviews without the scheduling hassles or travel time and expenses. With a good video interviewing platform, you’ll be able to choose different video options depending on your needs. The two most common video interview styles used by recruiters and hiring managers are live-video interviews and one-way video interviews. Live-video interviews are the most similar to an in-person interview. You still need to schedule a time that works for all parties involved, but with everyone being able to “attend” the interview from a remote location, there is no need for anyone to travel and scheduling becomes much easier. The interview interaction very closely mimics that of actually being in the same room with each other. You’re able to see and hear responses in real time, but it also gets recorded so the interview can be shared with other stakeholders who weren’t present during the live version. The recordings can be scored or ranked so the best get first priority when collaborating with stakeholders. In One-way interviews, candidates are emailed a link they can access at any time that’s convenient for them. They are provided with text or video-based questions that they will answer via recorded video. In their video recording, candidates will demonstrate their personalities and discuss their skills. Depending on the video platform you use, you can customize options like how long someone can sit and think before hitting record to answer each question. And you can standardize questions for each job so comparing applicants is easy. After a candidate submits his or her video, the recruiter or hiring manager can view the interview whenever it’s convenient and can share it with others on the team who have a vested interest. A good platform will also have tech support available to help with everything from set-up to viewing and sharing recordings to troubleshooting technical problems. There are plenty of reasons to incorporate video interviews into your standard hiring practices. · One of the best aspects of video interviews is how much time they save. Rather than being at the mercy of travel arrangements for candidates who live a long distance from the job location or interview site, video interviews can be done almost immediately and without the expense of airfare, hotels, etc. In addition, hiring managers can review and make decisions about a multitude of video interviews in the amount of time it normally takes to schedule and conduct just one traditional, face-to-face interview. And, with the ease that video interviewing provides, recruiters and hiring managers can get more in-depth information from candidates early in the process, rather than waiting until later to set up an actual interview. Overall, getting through interviews faster shortens the length of hiring time. Quicker hiring means less chance of losing good candidates. · Collaboration also improves with recorded video interviews because every member of the team or group of stakeholders can see the interview first hand without actually having to be present at the exact time and location of an in-person interview. · Job applicants like to know they’re dealing with companies that are up on cutting edge technology. Using video interviews sends a positive message and is likely to help attract top talent. · Being able to sort through a large talent pool quickly provides the opportunity to interview many more people than standard interviewing would allow. And with more people available, the more options you have for better hires. · Video interviews allow you to continually add to your talent pool. Even if someone isn’t a great fit for the current job opening, you’ve got an interview already on file for consideration when other job opportunities arise. To learn more about getting started with video interviewing and other cutting edge recruiting practices, call us at 415-835-0202 or email us at sales@talentcircles.com. It may sound old fashioned, however nothing thrashes sitting with a competitor over some espresso and doing a profound jump about their experience. Does this take a considerable measure of time? Yes, having a discussion with a competitor is a venture yet would it say it isn't one you ought to make with somebody conceivably joining your organization? Most dire outcome imaginable is that the applicant won't get an offer yet will leave at any rate feeling listened.